The past few days I've been cruising Pinterest night after night only to find myself focusing back on interior designs that feature zebra rugs. They add just the right amount of pizazz to sophisticated living spaces and can also act as a neutral in eclectic interiors. I particularly love designs where zebra carpets are layered over another patterned rug. To get a rich look try topping off an oriental rug with your zebra flooring of choice, or for a more modern feel layer atop another geometric rug like this. i love the black colour room with pop colour furniture with white linings.im planning to repainted my sister room,the problem now is the bedroom color needed to be paint first before the room.if not i dont think i be able to continue the work. Very nice. Don't know if I could do the ones shaped like the animal but the rectangle ones look cool. This is such a bold look! I don't know if I could envision it in my home now (I feel like it's a bit too "high end" for my current decor) but it's definitely a look I'd like to try out in the future--especially considering how pretty these inspiration pictures are! You said it exactly right, and before I had even read your post and having only just looked at each picture above I was thinking "Pizazz - That is totally what the zebra rugs brings to the rooms!" Now you have me wondering if perhaps a zebra rug is just what I need in my living room. I love zebra rugs I have been thinking of putting one in my office. Love the pictures with the bookshelves! Never thought I'd be into anything animal print, but this is sooo great! There's so much more flair i a room with a rug like this! So cool. me encantan este tipo de post!! OMG! I love zebra!! Great post! I hope to move soon into a new apartment and your pics are inspiring. The pic with the yellow sofa is my fave!! Really nice blog u got here, im officially ur newest follower! Chceck out my new post from London Fashion Week! Wow, I'd never realized how great a zebra print can look in a room! So glad I found your blog - it's so cute! I can't wait to read more!! 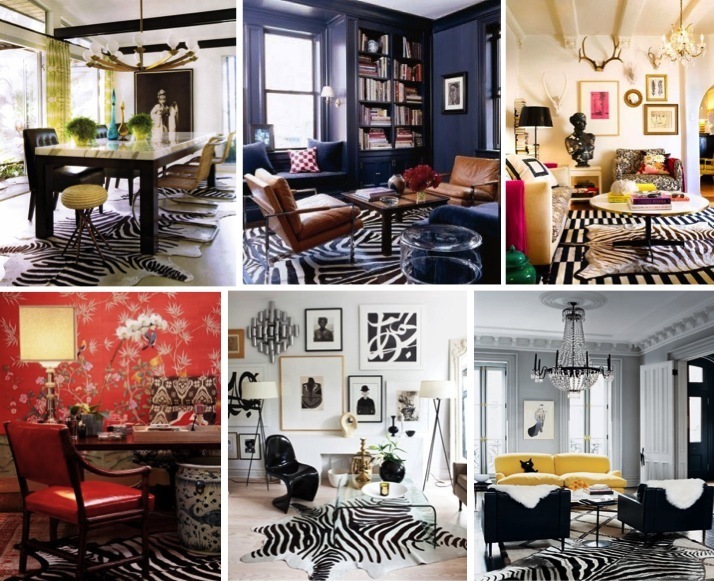 I love zebra rugs (faux of course) - I'd love one in my office! Its like you read my mind! You appear to understand so much approximately this, like you wrote the guide in it or something. I think that you simply could do with a few % to pressure the message house a little bit, however other than that, this is wonderful blog. A great read. I'll certainly be back. Hi. Love your pictures. I have referred to it on www.sebraskinn.no for Norwegians to enjoy! Thanks!